When a cop pulls you over and you know you are in trouble, your heart rate can rise, your mood can plummet, and your actions can put you in a worse situation than the one in which you began. 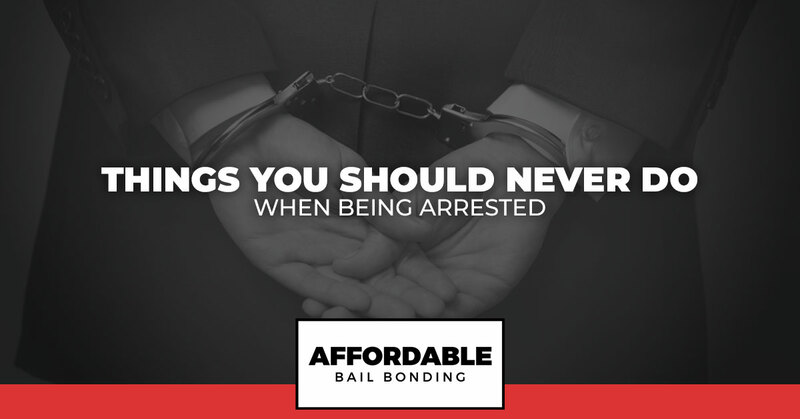 If you are facing an arrest, there are certain things you should and shouldn’t do. After you have been booked in jail, the same follows. As your local Salem bondsman, we understand how harrowing of an experience an arrest can truly be. That is why we are here to assist you with posting bail and getting out of jail fast. When you are facing an arrest, make sure you never do the following things during arrest or after. You might feel like now is the best time to curse and swear like a sailor but it truly is not. Though you might feel extremely mad about the situation you are in, you need to remain calm and collected. The more upset you allow yourself to become, the worse things will get. Using profane language can land you in more trouble with the cops who you are interacting with. While it is not federally illegal to curse at a cop, it is illegal to curse in public places in the state of Virginia. Not only is it a bad idea to cuss at a cop due to state laws, but it is also can lead to infuriating the officer you are dealing with. In turn, they might be extra hard on you and look for additional reasons to charge you. In some cases, if you are extremely agitated and yelling profanities, you might be charged with disorderly conduct, particularly if others around you start to join in on your anger. The bottom line: don’t swear during any interaction with an officer. It should probably go without saying, but never, under any circumstance, threaten an officer during an interaction. Threatening an officer in any way, using any language can result in severe charges. While you might never imagine yourself saying anything remotely threatening to an officer in day-to-day life, it is easy to slip up in the heat of the moment. No matter how angry a cop is making you or how unjust you feel a scenario is, do not try to intimidate a cop in any way, whether through bodily intimidation or verbal. Bottom line: be civil and do not say or do anything threatening to an officer. Sometimes during an arrest, you can feel as if your rights are being violated. You might feel extremely upset and perhaps rightly so. However, there is a time and a place to plead your case — in the court of law with an attorney by your side. During an arrest, you need to keep calm and save your anger for later. The more belligerent you become, the more the situation will escalate. Cops who become agitated with you might look for every single thing possible to charge you with. This can take what might have been a small incident and escalate it to a serious charge. The officers you interact with will have influence over what happens to you next, including important differentiations such as a misdemeanor or felony charge against you. Bottom line: act calm and be polite during an arrest. One of the absolute worst things you can do during an arrest is fighting the police officer or flee arrest. Both of these decisions could land you in a world of trouble. Fleeing arrest or resisting arrest are both considered obstructing justice and can result in further criminal charges against you. Fighting a police officer is considered assault on a police officer and will result in a felony charge. Nothing good comes from running away from a cop or fighting them. Bottom line: do not resist arrest or flee from an officer. Another way that people land themselves in more trouble than they started in is by talking too much. Remember, you are allowed to remain silent. Keeping quiet can be your best option, especially if you find yourself angry or anxious. Often, when we are upset we begin to babble and you might wind up saying more than you should have. It can be easy to feel stressed when talking to a police officer and you could say more than you intended, leading to the cops you are interacting with winding up with further knowledge of crimes you have committed. It is far wiser to stay quiet and wait for a lawyer to help you put together what you should say. Bottom line: when possible, stay silent and wait to speak to your attorney. Once you have been arrested, it is time to get to work. Instead of remaining stuck in jail, you can post bail and return to your normal life while you await trial. In most cases, a judge will determine an amount of money you can pay to bail your way out of jail. If you are given the chance to do so, take this opportunity. It will allow you to prepare for your trial from the comfort of your home. Bottom line: call a bail bondsman and get out of jail as soon as you can. If you need a bail bondsman in Salem to help you post bail, contact our team right away. We work around the clock and will help make bail affordable for you or your loved one who is behind bars.